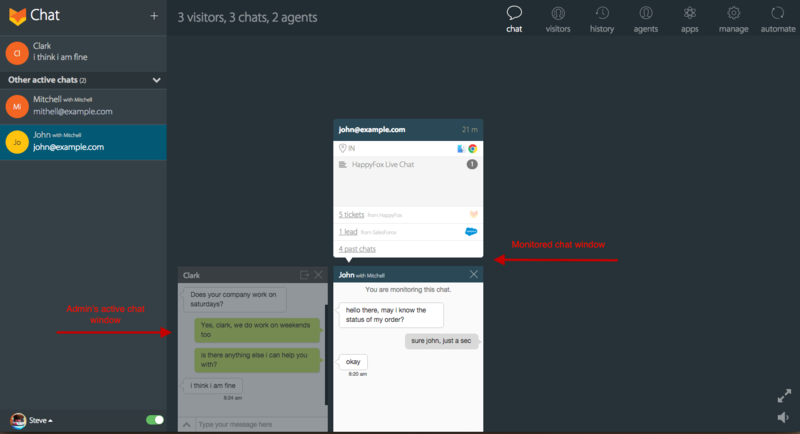 Monitor Chat feature allows admins and permission-enabled agents to view the ongoing chats handled by other admins/agents. Only admins can enable to permission for agents. 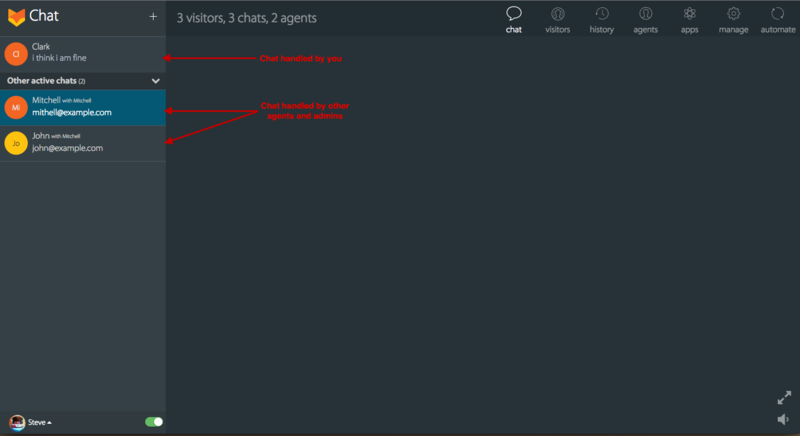 Admin/agent can not reply to the chat that is being monitoring by them. For Admins - Monitor Chat feature is available across all plans. For Agents - Permission to Monitor Chat is available from Fantastic plan. 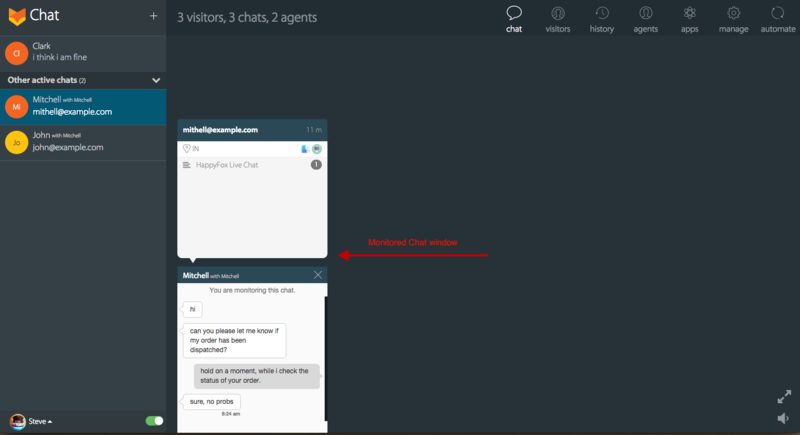 How can admins enable monitor chat permission for an agent? Go to Agents tab > Click on the particular agent's tile > If your account is on the Fantastic plan, you will see the option called 'Allow monitoring other chats'. Clicking this option will enable agents to monitor chats. To disable this permission, click 'Revoke monitoring permissions'. 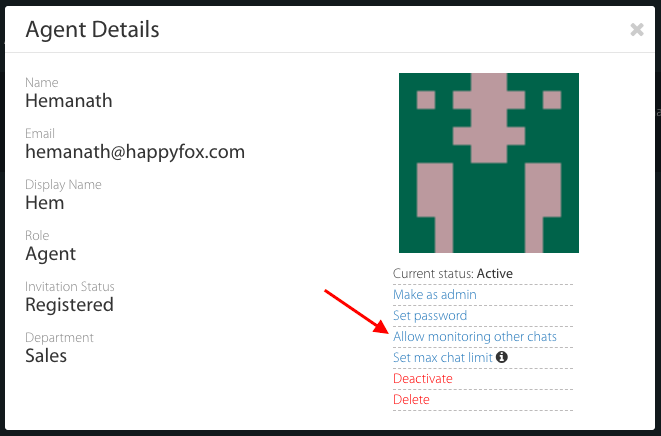 Inside HappyFox Chat, on the left side pane, admin/agent will be able to see the chats handled by them, followed by 'Other active chats' section. This section lists chats handled by other admins/agents. Click on any chats from the “Other active chats” section to start monitoring a chat conversation. The monitored chat window and active chat windows can be differentiated by the colour of the window. The monitored chat window will display all the details except the chat reply area. You can hide the monitored chats by closing the cross icon on the chat window. Or collapse the other active chats section by clicking on the downward arrow icon. All the actions done by the admin/agent who's handling chat, will be displayed in the monitored chat window. If the monitored chat is transferred to the monitoring admin/agent? The chat will become the admin/agent’s active chat and will not be listed under the “Other active chats” section.